One half of unique flip flop brand Gandys’ founding team, Paul Forkan is turning the negative experience of losing his parents in the Tsunami into a positive; helping orphaned children in developing countries. Having narrowly survived the Boxing Day Tsunami of 2004 at the age of 13, Paul Forkan and brother Rob wanted to “start something with real purpose”. So, after finishing their education, the brothers got jobs in London and saved up enough money to “continue the journey that their parents had started”. The brothers set off to travel the world, visiting various countries including Laos, Thailand, and India; the place where they had tragically lost their parents. On their return, they were determined to “do something […] that would help the people in the countries they had visited”; specifically focusing on children less fortunate than themselves. 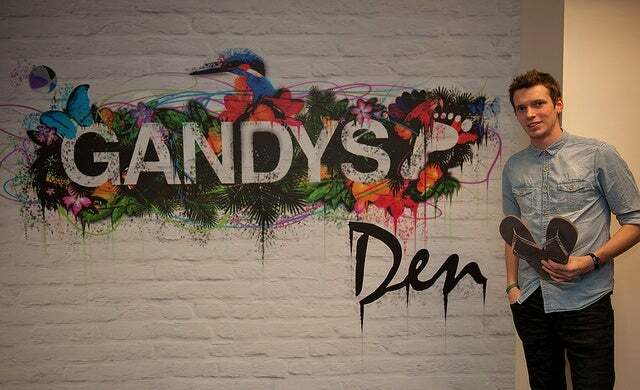 Believing that a flip flop company was “a great way to build something they really believed in”, in 2011 Gandys was born. A brand that “represents the values their parents had instilled in them”, Gandys gives a percentage of the profits from its flip flop sales to build orphanages through its charity the Gandys Foundation. Since its launch, the Forkan brothers have had a series of notable achievements; their distinctive style flip-flops are now stocked in several retail chains including Topman, Selfridges and House of Fraser, and the duo have had a “terrific reception” from consumers and the media, and worn by the likes of Sir Richard Branson (who stocks them on his island). To commemorate the 10th anniversary of the Tsunami this year, the brothers are on target to open their first children’s home in India, with a long-term goal to open several other homes across the world.